We are New Zealand's foremost online eLearning community. By enrolling for any of our dozens of both Verified and Non-Verified REA (Real Estate Authority) approved courses, you can fulfil your annual Continuing Professional Development (CPD) requirements. Our courses are offered online and allow completion from any computer, tablet or smartphone. 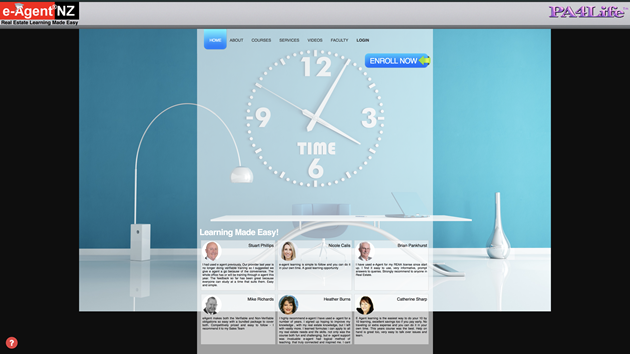 Save your professional time and money through eLearning. If you can email and browse the web, you are ready to start. (03-669-0750; 04-889-3766; 06-880-0053; 07-808-0830; 09-889-7653 or 0800-003439). NOTE: IF YOU REGISTERED FOR ANY COURSE SINCE 2016; DO NOT REGISTER AGAIN, BUT JUST LOGIN USING YOUR EXISTING ID AND PASSWORD AND SELECT YOUR 2018 COURSE.